Platinum subscription is the most complete level of our subscription program. As well as with the other levels, the Platinum subscription users can download all softwares updates and product service-packs released by Trace Software. Users can access to technical webinars (basic or advanced level), as well as the recorded webinars. Even after training, access to our technical department will provide the necessary reassurance when starting out with the software. Throughout your use of the software, some features are only very rarely used, or when you encounter a new use case, a quick call to our hotline will save you precious time. Response time is about 8 working hours. Moreover, users can pretend to 4 hours of free consulting services (Basic training is needed). For a fast getting started, a reference project can also be included in the software solution package. (1) Training webinars : 7 basics and 4 advanced per year. Access to recorded webinars. (2) E-Content Portal (ECP) for elecworks : each version will have access to specific content based on its features (Platinum subscriptions will have full access). (3) Total days per year. Travel expenses excluded. Basic Training course required. 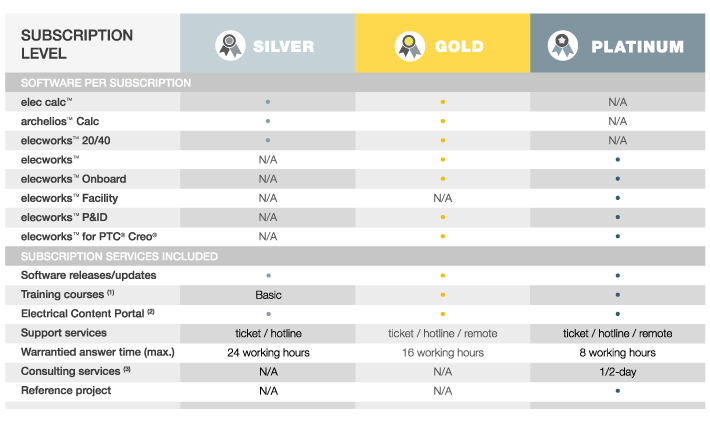 Subscription services are associated per contract.